The Common Room project was Stage 2 in the Master Plan, providing Study Rooms, Kitchen and Bathroom facilities, 2 modern Dance Studios and locker for Years 11-13. 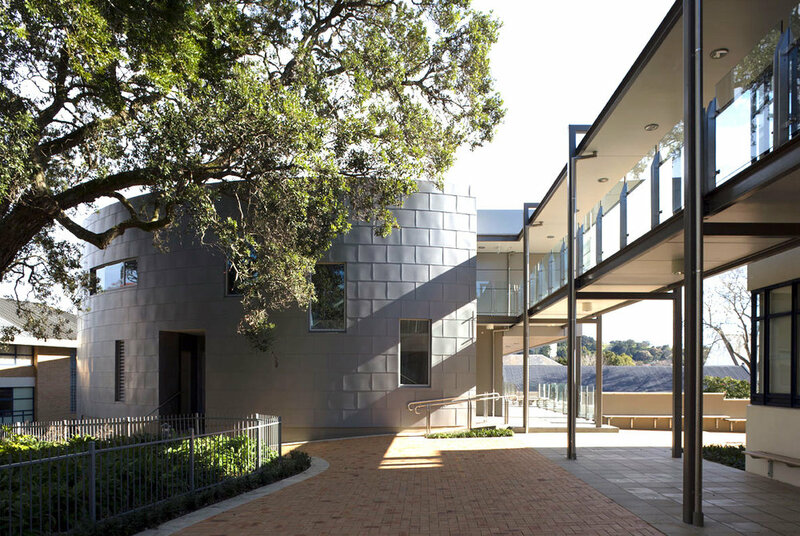 The building footprint is small with pedestrian traffic paths crisscrossing the site that is bounded by weatherboard heritage buildings, a 3 storey Science Centre and some dominant Kauri pine trees. The cylindrical form of the building enhances a successful flow and movement pattern around the campus and a bridge links with the adjoining buildings to provide accesss and interaction with the majestic trees at a high level. The zinc cladding provides a strong visual impact on the tight site and also successfully links the disparate characters of the surrounding buildings.